Photograph of the scarp displacement extending into the street near the right flank of the landslide. The City of Brainerd, Minnesota, said to be the birthplace of the legendary Paul Bunyan, is known for its abundance of water, with over 400 lakes located in the surrounding area. 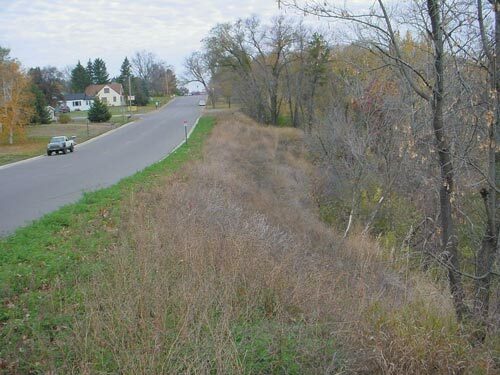 However, heavy spring rains in 2001 proved to be too much water, causing a section of the Mississippi River bluffs to give way, resulting in part of a busy city street to slide down towards the river. This prompted the City to close the north-bound lane to traffic until the landslide could be stabilized and repaired. Performing vibrocompaction within the landslide. The crane is positioned up slope from the landslide, outside of the slide area. The landslide occurred in the steep, 35 foot high, west bank of the Mississippi River bluff, parallel to S.W. Fourth Street. The landslide had a width of about 240 feet, with the head of the slide extending about five to six feet into the street. The initial movement formed a headscarp within the roadway having a vertical displacement of about 2.5 feet. In addition to the roadway distress, a City storm water pipe and river outfall traversed through the slide mass. The pipe was cracked and separated by the earth movement, allowing an uncontrolled amount of water to be introduced into the slide mass, potentially exacerbating the movement. Additional monitoring after the initial failure showed that the landslide continued to slowly move, or creep, down slope toward the river. 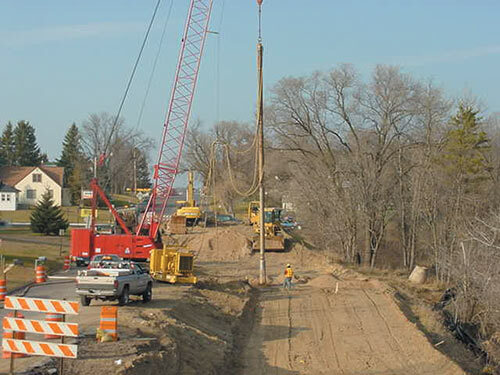 The City retained GME Consultants, Inc., Minneapolis, Minnesota, to investigate the landslide and develop a remedial design to stop the movement. Soil borings found that the headscarp developed within sand fill which was placed in 1964 when the road was widened. The sand fill was very loose and extended as deep as 19 feet. This fill was underlain by naturally occurring, loose to medium dense glacially deposited outwash sand, which was supported by dense silt at a depth of about 45 to 49 feet. In an attempt to evaluate the depth of the failure surface, inclinometer casings were installed within hand auger borings drilled into the slide mass. Inclinometers consist of internally-grooved PVC pipe, within which is inserted a special electronic probe that measures verticality at specific points within the casing. A number of readings were taken over time and compared with the initial base-line value to evaluate movement and the potential depth of sliding. From this monitoring it was deduced that the landslide was not a shallow, surface-type failure, but rather a deep-seated failure. Probe and follower pipe entering the ground aided by water pumping. A number of methods are available for the control of landslide movements. These include flattening of the slope, surface and subsurface water control, placement of earth buttresses or counter-weight fills at the toe of the slope, constructing retaining walls, placement of lightweight fills, and earth stabilization and reinforcement. Each alternative was considered in light of the subsurface conditions, the possible cause of the landslide movement, and the rather tight site boundaries. As an additional constraint, the slope was heavily vegetated beyond the crest toward the river, and the City wished to minimize the visual impact by keeping as many trees as possible. Although excavation of the upper portion of the landslide and replacement with lightweight fill would be beneficial in reducing the driving moment of the landslide, the apparent deep-seated nature of the slide would have warranted a rather deep subcut and replacement. Stabilization by anchored sheet pile retaining wall construction would have required the wall to have substantially long anchor tiebacks to resist the driving force of the landslide. In addition, the installation of the anchors within the rather steep, heavily wooded, river bluff would have been difficult. Buttressing the toe also would not be feasible since this would have destroyed a number of trees and would not have been aesthetically acceptable. The hydrostatic groundwater surface was deep, at slightly higher than the river elevation, but the control of other subsurface water sources, mainly from buried utility lines, would play an important part of the long term stabilization effort. Depression being backfilled with coarse sand as the probe continues the vibrocompaction process. diameter to 24 inches. The torpedo-shaped, hollow steel probe was attached to a 14 inch diameter steel follower pipe. The entire 54 foot long assembly was supported by a crane, and penetrated the ground by means of its weight and vibrations, accompanied by water jetting. Horizontal vibrations are generated at depth with the use of eccentric weights located within the probe that are rotated by means of electric motors rated up to 200 horse power, generating an eccentric force up to 40 tons. The vibrating probe has an operating frequency up to 1800 rpm. This vibration densifies and increases the shear strength of clean, loose sands, typically achieving a relative density of 70% to 85%. 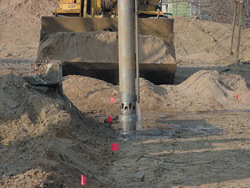 The vibrocompaction work was performed by the specialty geotechnical contractor, Hayward Baker Inc., Chicago, Illinois. Prior to stabilization, the head of the landslide was subcut up to about 10 feet, in order to relieve some of the landslide driving force during remedial construction, and to form a working bench. A 36 foot wide by 234 foot long bench with a grid of 135 compaction centers formed the area of stabilization. The compaction centers were spaced 9 feet on center. The effective compaction radius around each point is typically about 2 to 2.5 times the probe diameter, or on this project about 5 feet. The probe penetrated to depths of 30 to 40 feet below the working grade. Peak amperage draw of the probe was measured by an ammeter at the ground surface, and was used to monitor the densification process. In general, a 40 foot deep probe took about 30 to 40 minutes to complete. 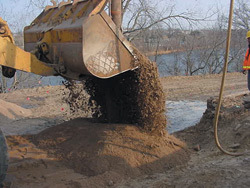 During compaction, a clean, coarse sand backfill was added from the ground surface to compensate for the reduction in soil volume resulting from the densification process. The densification was performed to increase the shear strength of the in-situ sand and achieve a calculated factor of safety of at least 1.3 with respect to the deep-seated stability of the landslide. Check borings were drilled and Standard Penetration Tests (SPT) were performed, along with electronic Cone Penetrometer Test (CPT) soundings, to evaluate the effectiveness of the vibrocompaction process. The results showed that the vibrocompaction effectively increased the shear strength of the sand to an acceptable level. Pre-construction SPT N-values within the loose sand fill were 2 and 3; post-densification N-values within the same zone of sand fill increased to between 11 and 28. To monitor ground vibrations away from the construction site, self-recording seismographs were placed near adjacent residential structures. The closest house was located about 60 feet from the vibrocompaction area, however all recorded vibrations were below a level established by the U.S. Bureau of Mines for potential damage to residential structures. the $360,000 budget. Civil engineer for the project was Widseth Smith Nolting and genernal contractor was Redstone Construction, both located in Brainerd. The site approximately 2 years after completion of the stabilization work looking across the fully vegetated crest of the slope. 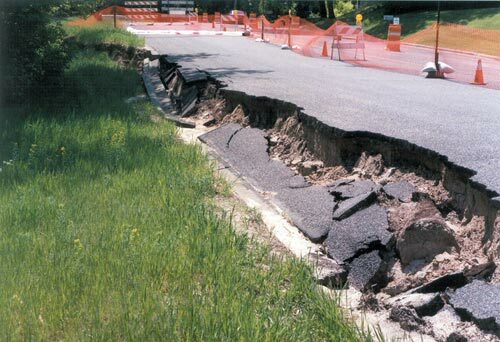 During the summer of 2002, after completion of the remedial work, Brainerd experienced a record storm and rainfall event in which over 7 inches of rain fell during a four day period; significantly more than that which fell at the time of the original landslide movement. The vibrocompacted soil held without any new detectable slope movement, and the remediation work has since performed as intended. For more information, contact Gregory R. Reuter, P.E., P.G., Principal Geotechnical Engineer, GME Consultants, Inc., 14000 21st Avenue North, Plymouth, MN 55447, (763) 559-1859, Fax. (763) 559-0720, e-mail: greuter@gmeconsultants.com. ©2003 - 1998 Land and Water, Inc.